– Characterization of thin epitaxial layers grown on silicon. 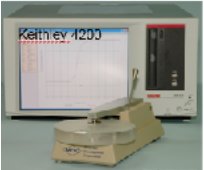 – Thin-film characterization screening tool to conduct rapid integrity tests on various substrate surfaces. – For MOS devices a darkbox is available to prevent light interference. – MDC-CSM/Win software can measure Mobile Ions, Lifetime, Gate Oxide Integrity, Interface Traps / Shallow or deep traps, Quasi-static, Multi-frequency, Thin oxides. – Perform rapid, non-destructive electrical characterization of non-metallized planar semiconductors: SiC, GaAs, 2DEG, GaN, AlGaN, InP, CdS, InSb, etc.